It is with profound sadness we announce the passing of Colonel Roger T. Cotton, age 54, of Wallace, NS, and formerly of Springhill, NS. Roger passed away on Saturday, January 19, 2019 in the Lillian Fraser Memorial Hospital, Tatamagouche. Born in Oshawa, Ontario, he was a son of John (Darlene) Cotton, Athol, and the late Sarah Jane (Moran) Cotton. Colonel Roger Cotton was born in Oshawa, Ontario and raised in Springhill, Nova Scotia. He joined the Canadian Forces in June 1983 under the Regular Officer Training Program and attended St Francis Xavier University in Antigonish and the Technical University of Nova Scotia (now DalTech) in Halifax, receiving a Bachelor’s degree in Computer Science. After completing Armour officer training, he joined The Royal Canadian Dragoons in Petawawa in 1987. He married Elizabeth Quinn, also from Springhill, that same year. He has held various Regimental command and staff appointments in both tank and reconnaissance environments, culminating with command of the 3rd Battalion The Royal Canadian Regiment Battle Group Reconnaissance Squadron during Op PALLADIUM (Bosnia) Roto 8. Other key appointments have included instructional duties at the Canadian Forces Officer Candidate School in Chilliwack, Chief Instructor of the Tactics School in Gagetown and appointments as Directing Staff and member of the Formation Operations Centre of Excellence at the Canadian Army Command and Staff College in Kingston. Formation-level staff appointments have included G3 Plans and G3 Operations of 2 Canadian Mechanized Brigade Group in Petawawa, J5 of Joint Task Force Afghanistan Headquarters and J5 then J3 of 1st Canadian Division Headquarters in Kingston. He commanded the Tactics School at the Combat Training Centre in Gagetown from June 2008 until July 2010. He has participated in overseas missions in Cyprus (1989), Bosnia (1995 and 2001), Former Yugoslav Republic of Macedonia (2001) and Afghanistan (2010-2011). 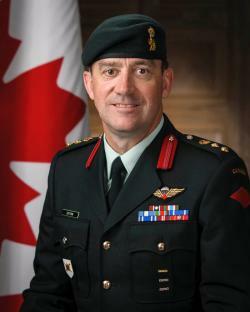 Colonel Cotton completed Command and Staff Course 31 at the Canadian Forces College in Toronto in 2004 where he was awarded a Master’s degree in Defence Studies from the Royal Military College of Canada. He has been awarded the Chief of Defence Staff, Commander Canadian Army and Commander Combined Joint Operations Command Commendations. Colonel Cotton completed Italian language training at the Canadian Forces Language School in Asticou, PQ. He was then posted to Rome, Italy as the Defence Attache at the Canadian Embassy. In addition to his father and step mother, he will be deeply missed by his wife, the former Elizabeth Quinn, Wallace, NS; daughters, Amanda (Eric Turenne), Ottawa, ON and Amy, Toronto, ON; brother, Alton (Holly), Springhill, NS; nephew Lucas Cotton and niece Kenesha (Bradley) McCormick; several aunts, uncles, and cousins. Arrangements are under the care and guidance of A.H. Brown Funeral Home, 5 McFarlane Street, Springhill, NS, (902-597-2361). A Regimental Funeral will be held at the St. Andrews Wesley United Church, Springhill, NS, on Saturday, February 2, 2019 at 2 pm. All are invited to attend. Burial will take place in the Athol Cemetery at a later date. Donations in memory of Roger may be made to the Canadian Cancer Society, or a charity of your choice. Sharing of memories and condolences may be sent to the family by visiting Roger's online memorial at www.brownsfuneralhome.com or through the A.H. Brown Funeral Home Facebook Page.